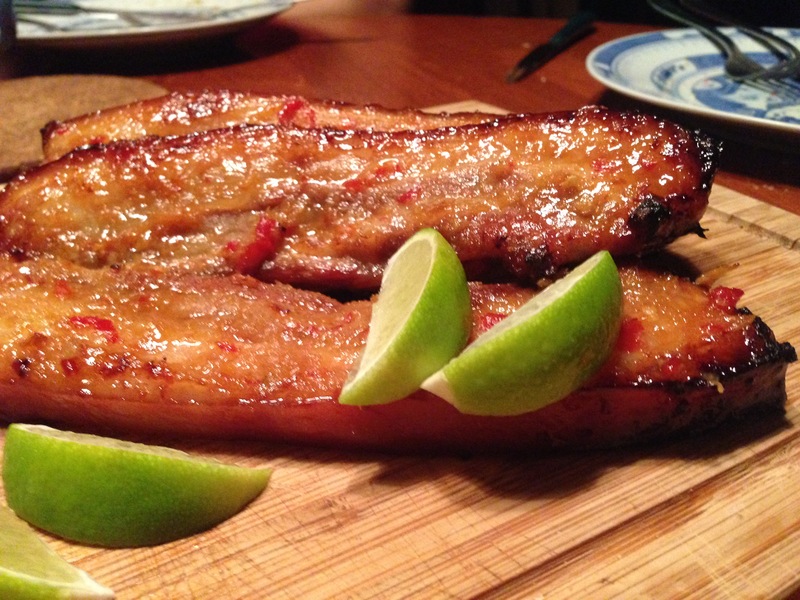 One of my favourite dishes to cook for a dinner party is this Twice-cooked Galangal Pork Belly, a delicious dish where you can do most of the work the day before leaving only the final grilling and glazing on event night. And versatile too!…served as a main dish with either couscous or quinoa salad, or sliced into strips and served as fork-food with cocktails or a chilled full-bodied Chardonnay! You can also get creative and change the flavours, using a Korean style Gochuchang marinade or Chinese dark soy, clove and star anise marinade, but keeping with the same concept and methodology. Braising then grilling and basting till caramelised…. Enjoy! Wash pork belly and pat dry. Blend galangal, red chillies, shallots, sliced lemon grass, gula melaka, fish sauce and soy sauce into a fine paste. 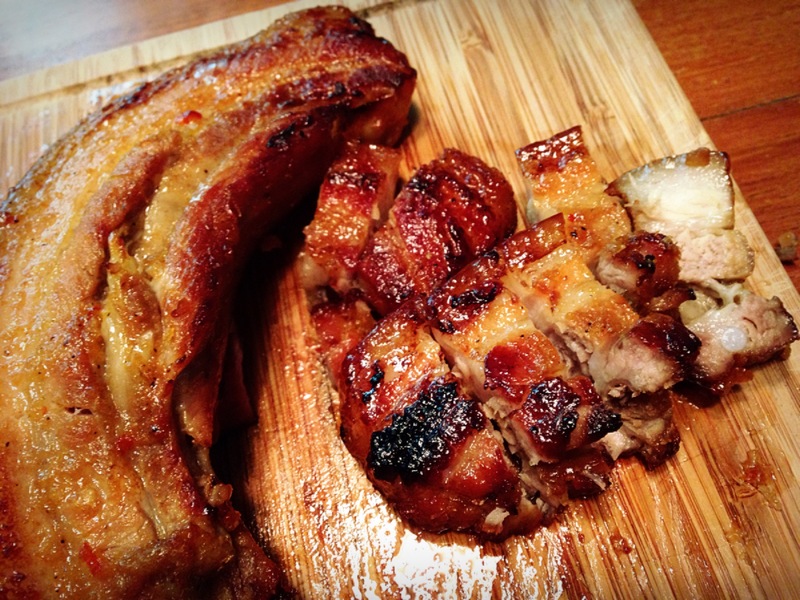 Marinate the pork belly with this paste for at least 2 hour. Heat up 2 tablespoons of soya oil in a flat bottomed pot and sear the pork belly, then add the remaining marinade, kaffir lime leaves and enough water to just cover the meat. Bring to a slow simmer, and cook for 45 minutes or until tender. Season with salt and pepper. Allow to cool, then refrigerate overnight if not needed immediately. Bring to room temperature before the second cooking. Preheat oven to 180’C, grill the strips of pork belly on a roasting pan, basting every 5 mins with the braising liquid till you get a delicious smell and a lovely char…about 15 mins. Serve hot with a wedge of lime, 1 strip each as a main course, or cut into pieces and serve it as fork-food starter. What a good idea on Friday. I will try this weekend and let you know how it goes.